A couple weeks ago, I found out that I was pregnant and miscarried all within a 24 hour period – super emotional day. This is a letter I wrote in the days that followed…feeling like I’m ready to share. Where do I even start. How do I begin to try and explain this beautiful mark you have left on my heart? It was April 16th. A Thursday. I must admit, excitement was not my first reaction when I saw the positive pregnancy test announcing your arrival into my life. I was shocked – so shocked that I took 2 more, all which gave the same result. Your dad’s response was very similar to mine (minus the tears). We didn’t have much time to discuss before he had to go to work so we agreed that we would talk some more about you after he got home. That discussion never happened. So, even though my heart was not yet fully connected, I began praising God for you. so I thank You for blessing me and my family with this child! The excitement started simmering as I began browsing Babycenter.com. It said that your due date was December 20th. I registered you on their website and signed up for weekly emails so I could follow along with your development on their Pregnancy Calendar. It said that you were 4 weeks and 6 days. A poppy seed! I laid my hand on my tummy as a smile awakened on my face. “..hi, my little poppy seed” were the first words I spoke to you. The excitement was bubbling over at this point. It’s amazing how quickly I fell in love with you. I started to ponder all the things I would want to do to prepare for your arrival. I found some sewing projects on Pinterest that I wanted to make for you. I also found some creative ways to fit 3 kids into one bedroom. I didn’t think there was anything that could wipe that smile away from my face..
..until it happened. It was about 7:30 that same night. I had just put your brother and sister down for bed and went into the bathroom. When I sat and looked down, a sudden horror filled me. Not knowing what I should do, I went and sat on the couch…just sat there. I eventually called your dad. As soon as he answered the phone the tears broke free. “you need to call the doctor’s office” was his somber response. The on-call doctor said that bleeding can be normal, or it could be a sign that I was losing you. All I could do was to wait. That night was one of the longest of my life. I called my doctor again in the morning and the nurse advised me to go to the ER…”It sounds like you are having a miscarriage”. After a urine test and a 3.5 hour wait, we finally got put into a room. The ER doctor’s words hit me like a punch to the stomach…”Your pregnancy test is negative”. Now, I can think of a thousand questions that I should have asked him, but the impact of his words left me speechless. I had just spent the last 24 hours pondering, reminiscing, loving, enjoying and rejoicing in the fact that you had been placed into my life. Then struggling, fearing, hurting, waiting, and agonizing the thought that you were so quickly slipping out of it. Now this guy is saying that it was all futile. Meaningless. There was only one of two possible answers..
On the drive home, I thought I was going to be sick from the roller-coaster of emotions I was riding. That afternoon and evening, I had multitudes of confusing feelings and questions raging in my head. For awhile, I was tempted with the thought that it would be easier to believe that those 3 tests were false positives. To believe that you never really existed. But, every time my mind would start to drift in this direction, there was a stronger current pulling it back. There was something in me that couldn’t deny that you were there – somehow, I just knew you were. Yet, I felt weird in allowing myself to believe it – in allowing my heart to ache for you when reality was saying that I really didn’t know for sure. With this word, He also gave me a permission that I was longing for. Permission to acknowledge that you do exist. Permission to acknowledge that He was forming you inside me, even if for just a brief moment. Permission to accept that you are real. And because you are real, you are significant. You are worth mourning over. You are worth feeling for – feeling pain, loss, sorrow and love. I could feel a lump rising in my throat. I held my breath to try to hold it in until I eventually couldn’t hold it any longer. I gave into it. Violent sobs came rushing out of me. I cried hard! I haven’t cried like that in a long time ever. I cried for your ultrasound pictures I will never get to see. Cried for your little kicks I will never get to feel. Your little hands I will never get to hold. Your little nose I will never get to kiss. Your sweet cries I will never get to comfort. Your little eyes I will never get to gaze into. Birthday parties I will never get to plan. Lullabies I will never get to sing. Baby booties I will never get to sew. This lasted late into the night and came with me into the shower the next morning…and many more tears have been shed since then. In fact, there has been some splashing on my computer as I write this letter to you. But I want you to know, my sweet child, that God’s goodness has been so amazing through all of it. In the midst of all this pain and emotion there is comfort. There is a deep, unquenchable satisfaction and joy in knowing that the same arms that now hold you are the same arms that hold me as I weep for you. The same eyes that now gaze upon you are the same eyes that see and know my aching heart. I am so thankful for you. Even though God gave you to me momentarily, you have left an eternal impression on my soul. You are teaching me to trust Him more deeply. More intimately. You are teaching me to surrender and let go in ways that I could never have imagined. You are teaching me how to relate to other mommies who have and will walk this path. You are teaching me how to grieve. I am full of sorrow that I will never get to meet you in this life. But, I rejoice in knowing that the day is coming soon in which I will be standing in His presence with you. Until then, my dear sweet child, you are forever in my heart. I am so sorry for your loss, Megan, because I understand your pain. 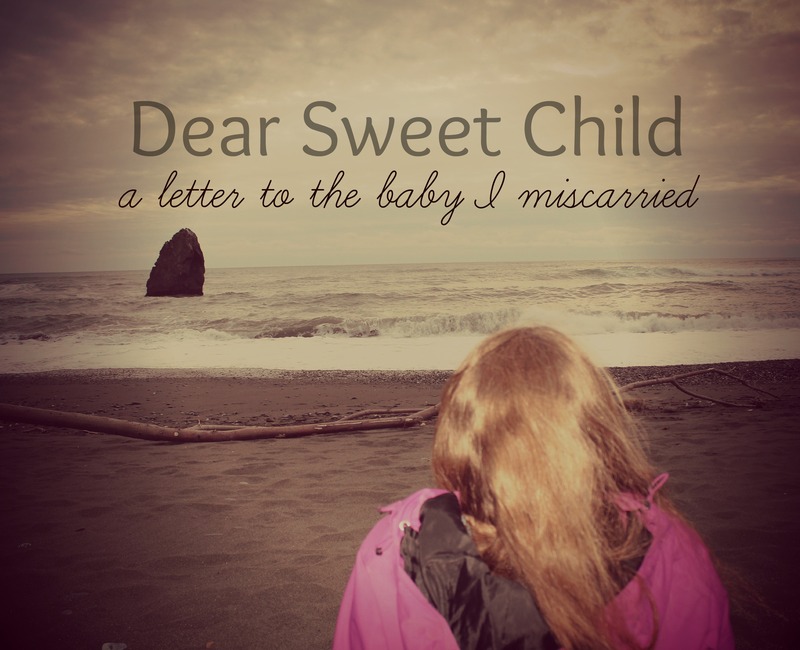 It has been thirty-five years since I miscarried, and I still remember the pain. I think it was at that point when I began to truly appreciate the depth of the term, “bittersweet”. Looking back, I can see how God used that loss to prepare my heart for the seasons to come but at the time it was just plain HARD. Praying for you with thanks for His Faithfulness . . . .
Time certainly helps, but you never forget. Oh Megan, this tore at my heart! I know your It is so brave of you to share. I am sure this will be an encouragement to many. Thank you, Kim! I debated as to whether or not I even wanted to share this. But I’m glad I did. If it encourages even one person it’s worth it. And I feel like it (in a small way) recognized and honors the life of this child. A gentle hug sent your way, Megan. Beautiful. Simply beautiful. This honors your sweet childs life and honors the One Who gave it.